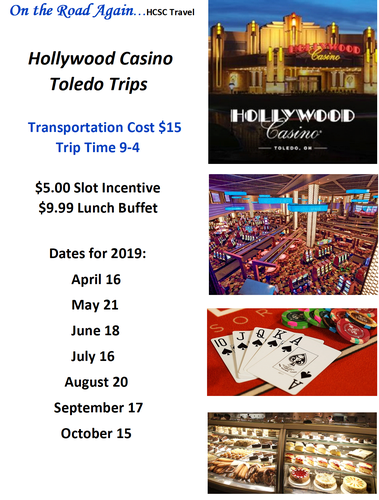 Hollywood Casino Toledo Trip. $5.00 Slot Incentive. $9.99 Lunch Buffet Available. Please register and pay in advance at the Henry County Senior Center. Leave from the Henry County Senior Center, 203 Rohrs St, Napoleon, OH 43545 at 9:00 am. Tuesday, April 16, 2019 from 9am-4pm.